Eos interviews the new chairperson about the committee’s plans to address climate change, STEM education and inclusiveness, and maintaining U.S. science leadership. Rep. Eddie Bernice Johnson, a Democrat from Texas who is the new chairperson of the House of Representatives’ Committee on Science, Space, and Technology, is proving that elections make a difference. 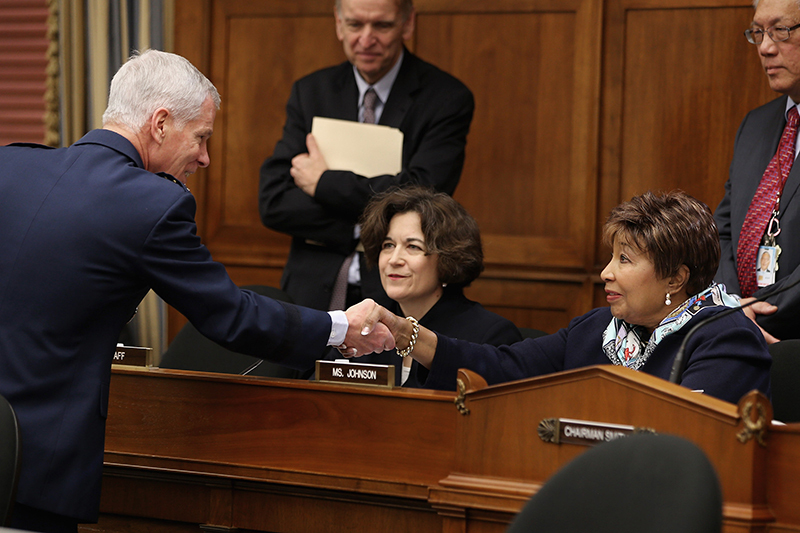 Johnson plans a full and active agenda for the committee to address the challenge of climate change and ensure U.S. global leadership in science, technology, engineering, and mathematics (STEM) areas. Also on the agenda is to “restore the credibility” of the committee “as a place where science is respected and recognized as a crucial input to good policymaking,” Johnson said in a statement after the Democrats won back the House in last November’s midterm elections. The committee promises to have a very different focus than it did under its former chair, retired Rep. Lamar Smith (R-Texas). Smith has called climate scientists “alarmists,” and his hometown newspaper, the San Antonio Express-News, has criticized Smith for the “abuse of his position” as committee chair. With the partial government shutdown, now in its 27th day, the committee has lost time in getting organized, and Johnson’s office currently does not know when committee members will be appointed. Johnson said that it was difficult to be in the minority on the committee when Smith was chairman. “It was not easy to be in the wilderness for so many years, because I kept thinking every day how we”—the committee—”were misstepping and essentially wasting time and trying to interfere with the various agencies that were looking and planning for the future rather than supporting them. That part of it we will end,” she said. Johnson previously has called climate change “perhaps the biggest challenge of our time.” In her interview with Eos, Johnson explained why she believes this to be the case. “If you read all the information that is coming from researchers all over, you will see that we are almost in a crisis shaped by neglect and not accepting that we’ve got to change our ways in how we use various forms of energy, and how easy it is for us to begin to make some of these corrections, of which we continue to ignore,” she said. Energy secretary Rick Perry, former governor of Texas, also visited with Johnson to see how they can work together on issues. “The mere fact that the change in leadership in the committee has come has made many of these people feel the responsibility of saying, Don’t look at me as just the enemy. You know, I’m willing to be at the table,” Johnson said. She said, however, that it is “yet to be determined” about any specific investigations about climate change. “We will have a very active committee. I intend to encourage subcommittees to meet. We will discuss what they have in mind and see if we can come up with a joint plan,” Johnson said. Johnson also noted that her committee is working with other committees that have similar jurisdictions “and see if we can’t do something more coordinated.” Those other committees with overlapping jurisdiction related to climate change include the House Committee on Natural Resources, the House Committee on Energy and Commerce, and a new House Select Committee on the Climate Crisis, which House Speaker Nancy Pelosi announced in December. The Science, Natural Resources, and Energy and Commerce committees plan to hold a coordinated series of hearings over a 2-day period early this year “to assess the effects of climate change and the need for action,” according to an announcement by the three committee chairs on 14 November. That is still the plan, but the government shutdown has delayed things, Johnson said. Where Does the Climate Crisis Committee Fit In? Johnson said that her understanding about the Select Committee on the Climate Crisis is that many of its members would be drawn from those who are on the other three committees that currently have jurisdiction over climate issues. She said that the select committee could make recommendations but that, unlike the standing committees, it would not have legislative or subpoena authority. Select committee chair Rep. Kathy Castor (D-Fla.) was quoted earlier this month in The Hill as saying that the committee will be “clearly in the spirit of the Green New Deal.” Rep. Alexandria Ocasio-Cortez (D-N.Y.), an early supporter of the Green New Deal, an initiative calling for bold action to address climate change, has tweeted that she applauds the select committee but that it is too weak without subpoena power. With the Science Committee having jurisdiction over much of the nation’s nondefense federal research and development portfolio, Johnson highlighted her support for federal science agencies, many of which, including NSF and the National Oceanic and Atmospheric Administration (NOAA), came under attack by the committee’s previous chair, Rep. Smith. NSF, Johnson said, is “one of the best-run national science foundations in the world with peer review.” NOAA, she commented, “is one of the most important agencies we have,” and she wants to see NOAA “have the free hand to do [its] work.” She also expressed concern that 2 years into the Trump administration, NOAA still does not have an administrator. Johnson said several other concerns include the direction of the EPA and environmental rollbacks there, questions about the Trump administration’s proposal to end direct funding for the International Space Station by 2025, and getting detailed information about the administration’s proposed Space Force. Johnson, who has called for Republicans and Democrats on her committee to work together, recognizes that congressional progress on climate change and other issues could be difficult in the current political environment, with President Trump moving in the opposite direction and with Republicans controlling the Senate. What would Johnson want to tell President Trump about climate change? “I would try to convince him how important it is to face the truth,” the chairperson told Eos. Citation: Showstack, R. (2019), Johnson plans to restore credibility to House Science Committee, Eos, 100, https://doi.org/10.1029/2019EO114095. Published on 17 January 2019.